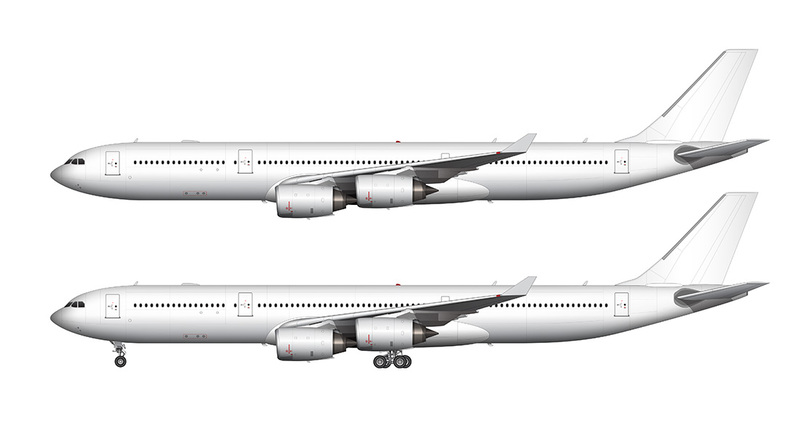 Here we go – now we are getting into the “fun” variants of the A340! 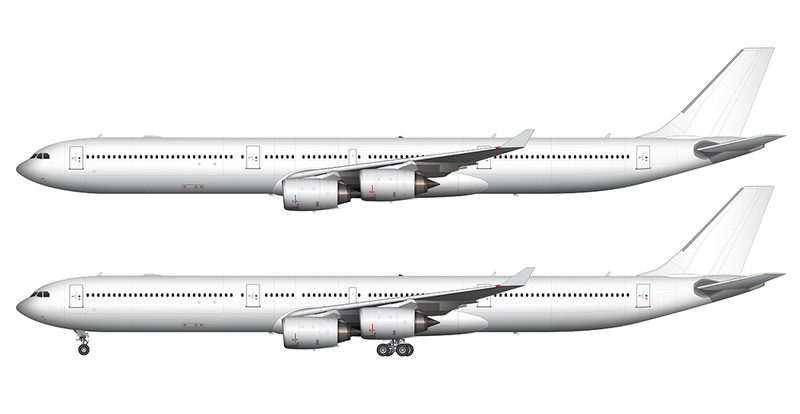 The A340 templates I posted last April were of the -300 variant which, to be quite honest, isn’t a very remarkable airplane. The biggest issue is how underpowered it is (despite having 4-engines), and quite a few airlines have voiced their disappointment in it’s overall performance over the years. It’s a well-built and reliable aircraft no doubt, but it just didn’t live up to it’s promises. But then the stretched and re-engined -500 and -600 variants came along, and the A340 became relevant and competitive again. These aircraft were so much more capable than the -300 and -200 in pretty much every regard. More power, more range, and higher payload capabilities are just a few of the things which gave new life to this aircraft family. Unfortunately, most of the airline industry is moving away from 4-engined aircraft and the future isn’t looking good for the A340. The twin-engine A350 is simply the better option for most airlines that need an aircraft of this size. The beefy engines on the -500 and -600 are exactly what the A340 needed to make it fit the image of a capable high-performance airliner. The -200 and -300 variants had tiny engines which didn’t really fit the proportions of the fuselage all that well, but these big Rolls Royce Trent 553’s hanging under the wings balance things out nicely. You already know my stance on big-engined aircraft (the bigger the better!) so there’s no point in spewing off about that again. This post is for the -500 templates only, but I’ll be posting the -600 very soon. The wireframe line drawing is complete, and I’m almost done creating the all-white rendered version. There are a few minor details that I’m having a hard time verifying, so I’d rather spend the time to make sure that I get it right before rushing though it and posting something that is incorrect. Look for those templates soon! FANTASTIC THE A345 IT’S THE BEST!!!!!!! 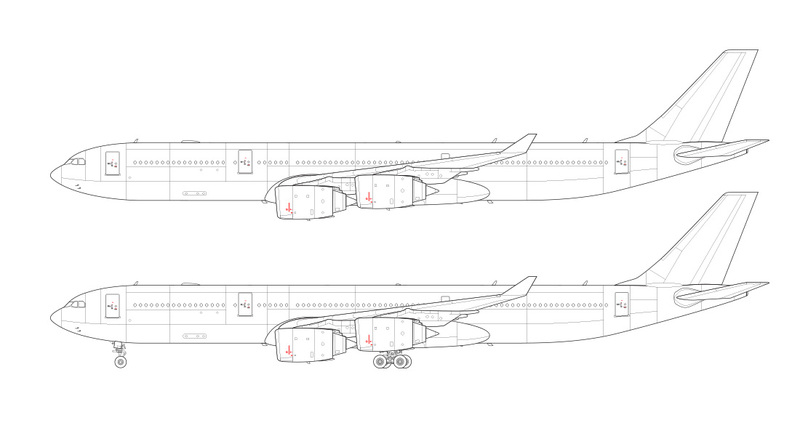 I truly love the A340-500 illustration so much. Once again you’ve outdone yourself. 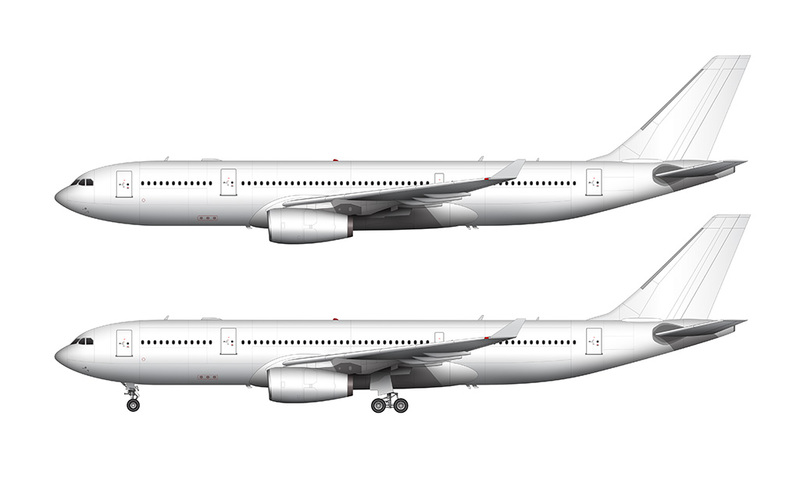 So, I’m designing an upgraded variant of the Airbus A310-300 for a business jet customer. May you do me a favor and do a small custom edit to your A310 illustration and replace the current engine with a geNX 1B engine (the one on the Boeing 787-8 and -9) and replace the current winglets with split scimitar winglets of the 737-900 because I’m too much of a rookie on Photoshop to do such a complicated job. If you do it, please send it to my email. Thanks Parsa – I always appreciate the compliments! Thanks! The 747SP is one I’d like to do soon but the the Beluga will probably take a little longer. Congratulations by the models, they are really great!!! Not sure if you are aware, but there is a link to this site in tje Marvel Doctor Strange movie. The QR codes in the file that Strange reads after his accident brought us here. Cool work by the way.